Haaretz Israeli newspaper said, on Sunday, that USAID relief organization is to close its Palestinian branch by 2019. Security sources reportedly assert that this move comes in the context of downsizing the UNRWA budgets, which was initiated by Washington, recently. The sources added, according to Al Ray Palestinian Media Agency, that closing USAID would deteriorate the humanitarian conditions in the Gaza Strip, driving Israel to bear the security, financial, and health responsibilities due to the worsening conditions in the Gaza Strip. 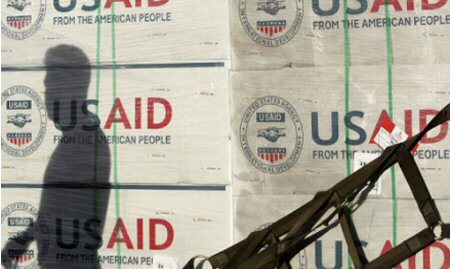 USAID is considered to be the prime, as well as the largest, organization which provides humanitarian aid to Palestinians in the Gaza Strip and the occupied West Bank, since 1994. The US Department of State informed, last week, the management of the organization to curtail half of its employees in the organization, which number at about 180. Closing the USAID branch in Palestine is authorized as part of a decision by US President Donald Trump to suspend an amount of $250 million from the UNRWA’s budget for the Palestinians, of which $215 million were allocated to the economic development and humanitarian aid.